The Civil Service Commission(CSC) named the 85 successful examinees of April 2016 Civil Service Exam - Paper and Pencil Test (CSE-PPT) professional level for Autonomous Region in Muslim Mindanao (ARMM). 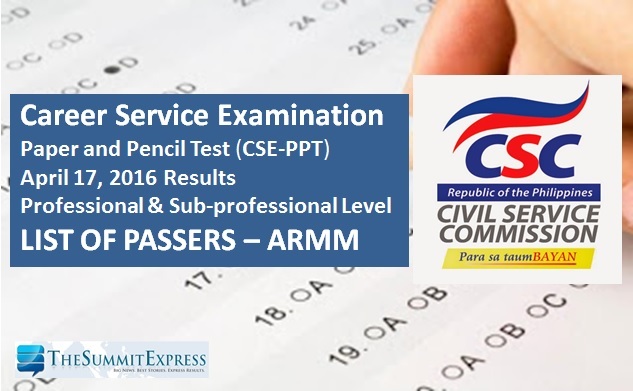 CSC announced the results for Civil Service Exam - Paper and Pencil Test (CSE-PPT) professional level on Thursday, May 26. The agency added that CS passers who got at least 80 percent score will be eligible for the first and second level positions in the civil service provided the eligibles meet the qualifications and other requirements of the positions (education, experience, and training). Below is the full list of successful examinees for ARMM (Basilan, Lanao del Sur, Maguindanao, Sulu, Tawi-Tawi) civil service exam (CSE-PPT) professional and sub-professional levels.